Have you noticed that your dog gets a bit, shall we say, bitey around Halloween? Changes in routine and the strange sights and sounds associated with events such as Halloween can cause dogs to stress out, turning a normally placid family dog into a biter. Try seeing it from the dog’s point of view: all of a sudden there are a bunch of people showing up at the door in strange costumes, but never being invited in. If you didn’t know what was going on, what might you think? Here are some tips from Doggone Safe and Korrect Kritters®, LLC, for alleviating some of the stress and keeping your family safe from a stressed out pooch. Secure your dog behind a closed door or in a crate in a room away from the front door or the party if children are meeting at your house. Give your dog a juicy bone from the butcher, a sterilized bone or Kong stuffed with hotdog, Rollover or other soft dog treats or a pre-stuffed bone from the pet store. Play music or leave a TV or radio playing in the dogâ€™s room to help mask the sounds of the activity at the front door. Close drapes so that the dog does not see people coming and going through the window. Puppies and dogs that like to chase can get overly excited by costumes with dangly pieces or streaming material. Supervise very carefully if you have a dog that may try to play with your childrenâ€™s costumes while they are wearing them. Teach kids to Be a Tree and stand still if the dog does start nipping at their costume since the more they move, the more exited the dog will get. Keep your dogs (and cats) indoors around Halloween time. 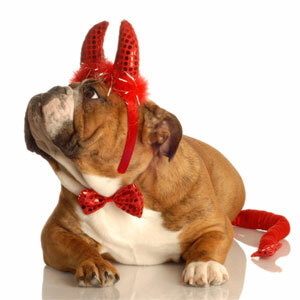 Pets have been stolen, injured or poisoned as part of Halloween pranks or other rituals. If an owner opens the door and there is a dog there, just stay still and wait for the dog owner to put the dog away. You can tell them you do not want to come near the dog. Do not move toward the person and dog. Wait for them to come to you to give you your candy. Wait for them to close the door before you turn and leave. If a dog escapes just stand still and Be a Tree (hands folded in front, watching your feet). He will just sniff you and then move on. Wait for the owner to come and get the dog before you turn away. It is best to ignore other peopleâ€™s dogs on Halloween if you meet them out walking. The dog may be worried about all the strange creatures that are out and about. Even if you know the dog, he may not recognize you in your costume.